The festivities at La Paulée continued with this superb lunch prepared by Daniel Boulud and his team of brilliant young chefs. All of the dishes were perfectly executed and utterly delicious. 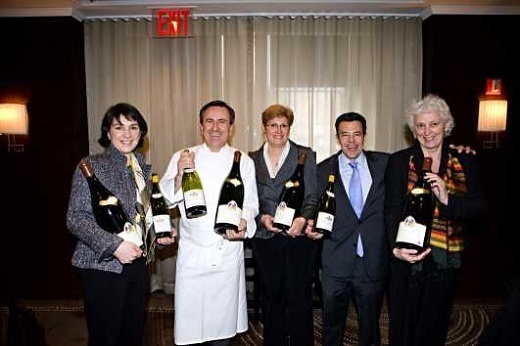 Anne-Claude Leflaive and sisters Marie-Andrée and Marie-Christine Mugneret offered an incredible selection of bottles from their own cellars. The growers were quite humble and even a touch reserved, as they were clearly moved by the significance of showing so many older vintages. Almost all of the wines were served from large formats, which added to the importance of the occasion. 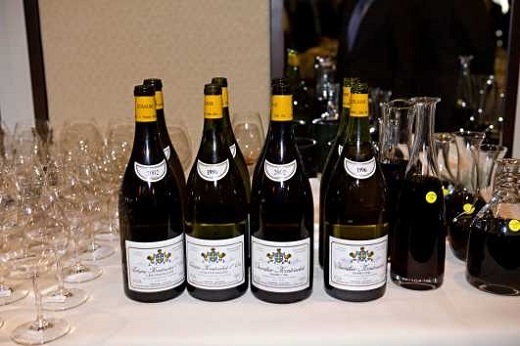 The Leflaive wines were served in pairs, which gave tasters an invaluable opportunity to compare the estate’s Puligny-Montrachet Les Pucelles with the Chevalier-Montrachet across three vintages; 2002, 1996 and 1983. Les Pucelles is a 1er cru and Chevalier-Montrachet is, of course, a grand cru, but in all three flights I preferred the Pucelles for their greater verve, minerality and freshness. The Chevalier-Montrachets favored a more full-bodied, opulent expression of fruit which was certainly magnificent, but offered less complexity than the Pucelles. At this level, though, that was truly splitting hairs as all six wines from Leflaive were breathtaking. The 2002 Puligny-Montrachet Les Pucelles (magnum) was a sensual, seductive wine endowed with marvelous opulence and richness. The wine’s clarity and precision were simply remarkable. Clean notes of minerality framed the long finish. The 2002 Chevalier-Montrachet (magnum) was rich and explosive in its honey, apricots and smoke. The wine revealed tons of inner perfume and a botrytis-like sweetness that was sublime. Leflaive’s 1996 Puligny-Montrachet Les Pucelles (magnum) showed breathtaking richness in a dense, weighty style. Exotic fruit intermingled with smoke and liquefied rocks as this full-bodied Burgundy opened up in the glass. Superb length and a clean, refreshing finish rounded out this gorgeous white. 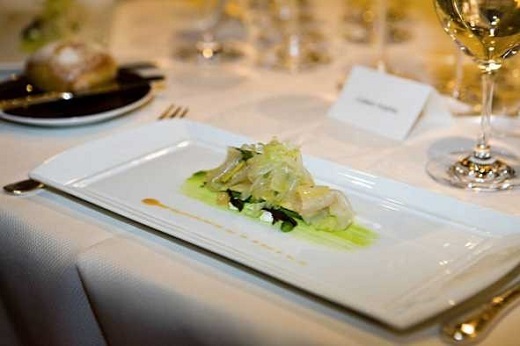 The 1996 Chevalier-Montrachet (magnum) was more advanced in its tertiary aromas and flavors. Honey, roasted nuts and truffles emerged as this richly-textured wine opened up in the glass. As beautiful as it was, I expected a little more freshness for a grand cru white at this age, notwithstanding everything that has been written about the early maturation of this vintage. The Citrus Cured Fluke that was served with the 2002s and 1996s was sublime. The best was saved for last however, as this flight of 1983s was extra-terrestrial. The 1983 Puligny-Montrachet Les Pucelles (magnum) was profound and very close to perfect. An utterly engaging, compelling Burgundy, the 1983 Pucelles flowed from the glass with a creamy- textured expression of fruit. Seamless and incredibly pure, the wine revealed tons of persistence and a long, clean finish. It was pure magic. The 1983 Chevalier-Montrachet was also sensual and harmonious. It had developed an almost liqueur-like sweetness, with tons of roundness and finesse on the close. As magnificent as it was, I found myself mesmerized by the Pucelles, which was still magical several hours after having been poured. What a flight! Chef Boulud’s Kataifi Crusted Sea Scallops were divine with the 1983s, although these two Burgundies would have been superb with just about anything. Next up was a magnificent flight of Ruchottes-Chambertin from Mugneret, all served from jeroboam. I was a little surprised that that Ruchottes were served before the Chambolle-Musigny Les Feusselottes as they were decidedly richer wines. The 1998 and 1992 Ruchottes came across as the most complete wines in the grouping. The 1998 Ruchottes-Chambertin was rich, dense and full-bodied, with surprising depth and tons of fruit. The 1992 was much more ethereal and delicate, but equally impressive in its overall balance. Worn-in leather, sweet spices, red fruit and underbrush came to life in this weightless, transparent Burgundy. The 2000 showed good balance in a mid-weight style. Though still quite fresh, the wine’s concentration came across as relatively modest and probably not suited to lengthy cellaring. The 1997 revealed gorgeous inner perfume in a vibrant, medium-bodied style. A flight of Mugneret’s Chambolle-Musigny Les Feusselottes, also from jeroboam, was intriguing, although on the whole, the wines weren’t as exciting as the Ruchottes that preceded them. The 1991 offered the best balance in this flight of Les Feusselottes. Aromatics, fruit and structure were all in gorgeous harmony. The 1988 and 1998 Feusselottes were both relatively small-scaled wines. The 1988 was a touch more perfumed and ethereal, while the 1998 was defined by slightly astringent tannins that conveyed an impression of leanness. The 1997 Feusselottes was marred by volatile acidity that made it hard to fully appreciate the wine. The Roasted Millbrook Venison Loin served with this flight was exceptional, but it probably would have paired better with Mugneret’s Ruchottes. I am not a huge sweets person, but I could not resist the spectacular Dark Chocolate Ganache, a beautifully presented dessert that revealed multiple combinations of flavor and texture in stunning style.